You can tell potential clients that your agency does great work, but it’s far more effective to show them. 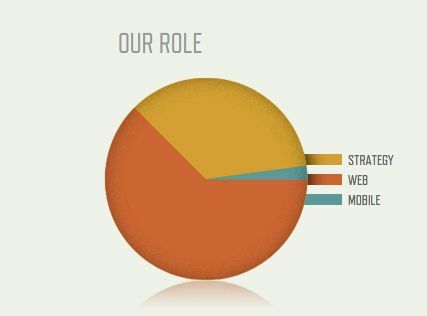 This is why having a strong online portfolio page on your website is important for every agency. When visitors scan your previous work, they are looking for evidence of your firm’s talent, innovation, and capabilities. Want to make sure they find it? Incorporate these six elements into your online portfolio page. Presenting every project your agency has ever completed will overwhelm your site visitors and potentially cause them to overlook “the good stuff,” a.k.a. your most impressive or strategically chosen work. There are a couple of ways to choose which projects you display. If your agency has multiple services (for example, design work, web development, and marketing strategy), then include an equal mix of case studies from each. If someone looking for a specific service finds your site, you’ll want approximately 30 percent of your work samples to be applicable. Alternatively, if you’ve done a lot of work in one area but want to expand into another, use the greatest number of examples from the service you’re looking to build on. Let’s say your agency has helped develop two apps, but you’d like app development to become your core business. Put the app case studies at the top of the page and/or make them the most prominent. When people looking for app development come to your page, they’ll immediately see that’s one of your agency’s focus areas. And in one case, it does make sense to include all your work: When you’ve done less than eight or so projects. 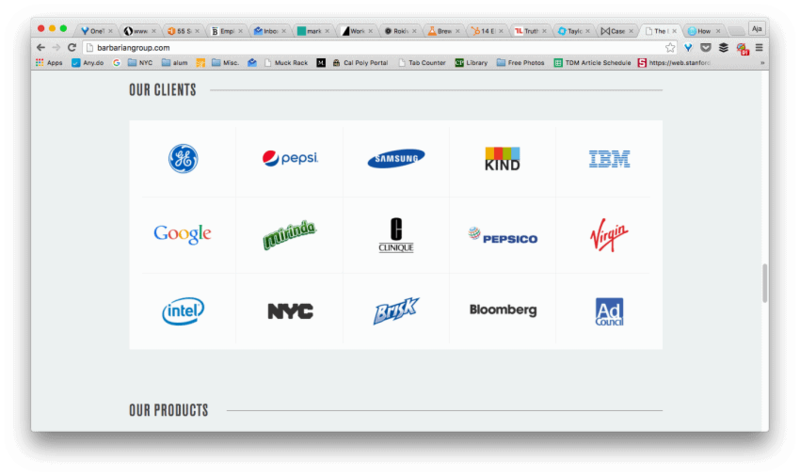 Also, if you’ve worked with a high number of very well-known companies, consider adding a “Clients” section with logos, like the below example from the Barbarian Group. Which means you can’t just show the work you’ve done for previous clients—you also need to relate its impact. Stats are the most concrete form measurement, and many times the most effective. Digital Agency Cobra Creative’s overview of a Lunafest project demonstrates that they are aware of this. Check out the success metrics they’ve included below. There are times you won’t be able to describe a project’s results with data. Sometimes the client doesn’t provide it, or sometimes it just doesn’t exist. Fortunately, you can still show ROI by describing non-quantifiable outcomes, as ThinkApps has done. If you need more help, go back to the project proposal or documentation and look for the agreed-upon objectives. Assuming you fulfilled those, insert them into your “Work” page. Finally, test whether a work sample fulfills the impact requirement by asking an outsider if he or she can tell you how your client benefited from that project. If he or she struggles to answer, then you need to make the impact clearer. When it comes to your work, don’t limit yourself to photos and screenshots. After all, you’re trying to impress and engage potential clients. The more mediums you can use to do so, the better! Let’s start with video. We know video is one—if not the—most popular form of media (Cisco estimates that video will be 80% of Internet traffic by 2019.) The good news is, if you’re creative, you can incorporate videos into every work sample. 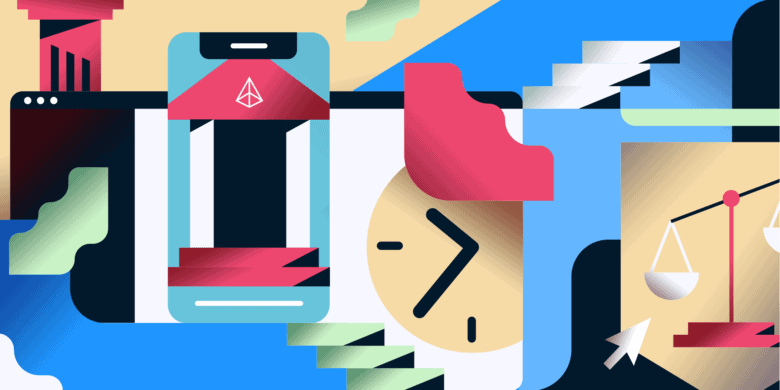 For example, you could do a video showing your progress over time: from initial sketches to wireframes to prototype to live product. Or, if the product was featured in a magazine or news outlet, you could create a “highlight reel” incorporating article quotes, video clips, feedback from users, and so on. Some products have video elements themselves. If you were involved in their creation, definitely include one or two clips. Apart from video, you can also use GIFs to show a sequence of actions within your product or to demonstrate a cool feature. Critical Mass used this awesome helicopter GIF as part of its “Travel Alberta” campaign. Or, along similar lines, weave in 3-D graphic models, as Truth Labs did. These make your site pop and are typically used to showcase physical products, geographic landscapes, or architecture, but you can also use them to illustrate data. Diagrams, graphics, and photos or videos of people using your product are other options to try out. Your portfolio page should require (or at least request) some engagement on the visitor’s end. Incorporating people into the experience will increase the amount of time they’re willing to spend browsing. One of the easiest ways to make your page interactive is to add graphics that draw viewers in and keep them scrolling. Make sure that the first image in your slideshow is highly compelling—and that each successive image gives a different view of the product or gives the visitor new information. If there isn’t a good reason to keep clicking through a slideshow, no one will. In addition, consider using click-through slideshows to vary the flow of the page. Most work samples are displayed vertically; having the occasional horizontal slideshow will stop your visitors from scrolling down too quickly and overlooking important details. You can also incorporate scroll interaction. This feature requires a little extra work, but it’s well worth it. Your visitors will be entranced by the effect. Plus, it’s a good way to show off your agency’s coding chops. To get a feel for some high-quality scroll work, go to La Moulade’s Work page. Looking for some unique ways to make your page interactive? Consider creating text overlays that pop up as users navigate. A major challenge of creating an awesome portfolio is maintaining your company’s style and voice while presenting projects you completed for other companies in their style and voice. It’s essential that you carry your agency’s personality through in your portfolio page since it’s a section of your website where visitors will spend a lot of time. First, I recommend keeping the formatting and aesthetic of your work samples and case studies consistent with the rest of the site. Oven Bits, a design, development, and product strategy agency, is operating by this principle. Its site is clean and minimalistic; the designers went with simple, modern typography, neutral colors, lots of white space, and gray-toned image backgrounds. The “Work” section adopts this style seamlessly. By building in lots of white space and using the same fonts for the accompanying text, it doesn’t feel like your browsing experience is changing whatsoever as you move from page to page. To follow Oven Bits’ lead, choose a relatively neutral color scheme. This ensures that it won’t clash with the colors in the work samples. The other five elements are necessary, but not sufficient. To land clients, you must impress and surprise them—and that means adding at least one unique detail to your “Work” section. Luckily, we’ve got lots of ideas for you. Choosing an agency is usually a group decision; as such, you can expect to have anywhere from two to eight people debating the merits of your work before they decide to hire you. 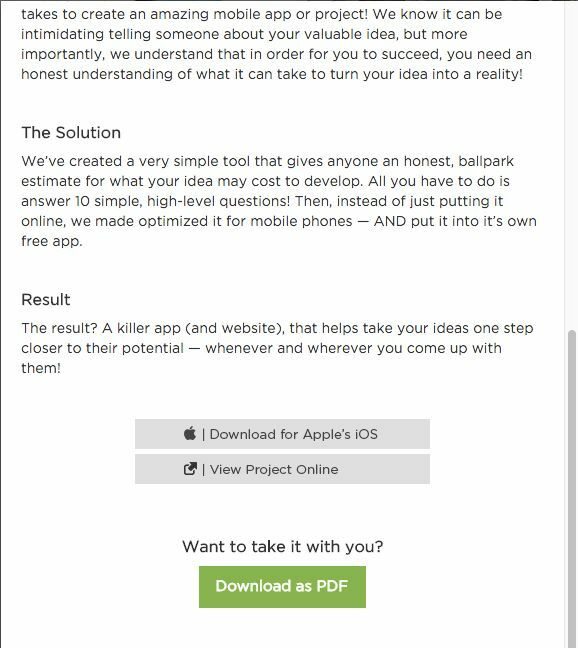 To make their decision easier—and to show off your foresight—add the option of downloading a PDF version of each work sample, as Gravity Jack has done. Give visitors more insight into your firm’s history and growth with a cool timeline. You can see this in action at the top of iAcquire’s portfolio page. If your work can naturally be separated into categories (by industry, by client type, by technology, etc. ), then it’s helpful to provide site visitors with a way to quickly find what they want. Eyeball, for example, lets you view its work by service. If most of your projects require several different skillsets, follow Cobra Creative’s approach and use a pie-chart to show the breakdown. Do you have a great online portfolio page? Does your agency’s portfolio page have a strategic selection of work, concrete and specific impacts, diverse and compelling media, interactivity, personality, and features that take it above and beyond? If not, it’s time to incorporate what you’re missing. While crafting a great online portfolio takes effort and imagination, the resulting increase in clients and projects will be worth it. If you’ve already got an awesome portfolio, let us know what your crucial elements are in the comments below. Are you managing or working for an agency? Then you might be interested in our podcast Agency Advantage, which delivers the most actionable advice for running an agency – check out the first episode. Freelancing Skills Tests: Do Your Scores Really Matter?